"We’re very excited to have FAST N’ LOUD’s Richard Rawlings and Aaron Kaufman run Mobil 1 through their gauntlet"
FAIRFAX, Va.--(BUSINESS WIRE)--To illustrate engine protection and performance benefits, the world’s leading synthetic motor oil brand, Mobil 1™, will be subjected to harsh out-of-the-lab analysis and testing during Hot N’ Cold, a two-part web series starring the hosts of Discovery Channel’s popular series FAST N’ LOUD, which airs as part of Discovery’s Motor Mondays. The real-world trials, which will be showcased on Discovery.com starting Monday, March 16, feature FAST N’ LOUD’s Richard Rawlings and Aaron Kaufman at their Gas Monkey Garage exploring how Mobil 1 protects the engine of a worn down vehicle when faced with strenuous conditions – persistent heat and ruthless cold. During the punishing heat test of Hot N’ Cold, Kaufman and Rawlings take an engine that’s clocked nearly 150,000 miles with minimal oil changes and fill it with Mobil 1 synthetic motor oil before completing 522 grueling laps around a racetrack in Texas. Engines see increased heat from circumstances such as a long drive, a blistering summer day or stop-and-go traffic, as seen by Rawlings and Kaufman’s test vehicle. 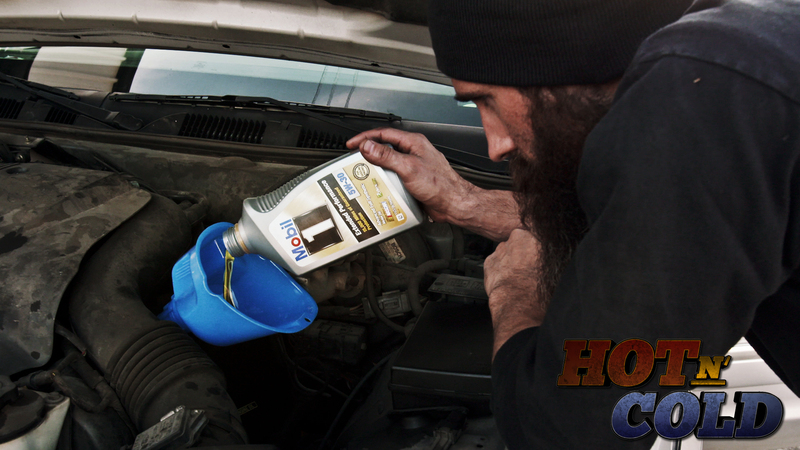 This heat can cause motor oil to oxidize, thicken and leave deposits, which can affect an engine’s performance. Mobil 1 synthetic motor oil provides outstanding high-temperature performance and is proven to protect at engine temperatures up to 500 degrees Fahrenheit. For the vicious cold test simulation of Hot N’ Cold at the Gas Monkey Garage, Kaufman places a bottle of Mobil 1 synthetic motor oil inside a cooler that contains dry ice. The freezing cooler drops the oil’s temperature to well below 0 degrees Fahrenheit. From there, Kaufman pours the oil in the car’s engine (the same car used in the heat test) and sees how well the oil can protect given its incredibly cold state. Cold weather can cause motor oil to flow either too slowly, or not at all, which can take a toll on an engine. As the FAST N’ LOUD duo’s dry ice cooler demonstrates, Mobil 1 synthetic motor oil flows at temperatures as low as -40 degrees Fahrenheit, so that a car gets the oil it needs immediately at startup. The advanced technology of Mobil 1 motor oil combines proprietary base stocks with a balanced additive system to provide protection in four dimensions – cold, heat, wear and sludge. Television’s #1 car show, FAST N’ LOUD, airs Mondays on Discovery Channel and features Dallas-based Richard Rawlings and Aaron Kaufman. While Richard has the eye for spotting that rare car find, Aaron is the master mechanic who decides if these relics are too far gone or ready for a Gas Monkey Garage overhaul. This dynamic duo travel back roads around the country scouring barns, swap meets and open fields in search of these rare rides - forgotten and neglected classic cars – to buy and restore. FAST N’ LOUD is one of the network’s top draws at Discovery.com, drawing millions of video streams each season. Follow the series on Facebook at Facebook.com/FastNLoudTV and on Twitter at @FastNLoudTV for the most up-to-date information. To learn more about FAST N’ LOUD, please visit Discovery.com/FastNLoud. For more information, visit mobil1.com, follow on Facebook at www.facebook.com/mobil1 and on Twitter at @Mobil1.